Custom soft black bear key tags make one brilliant and affordable gifting item the year around. It is well suited for new parents making baby announcements, toy stores, park districts, youth summer camps, pediatricians, dentists and many others, who are trying to impress kids. 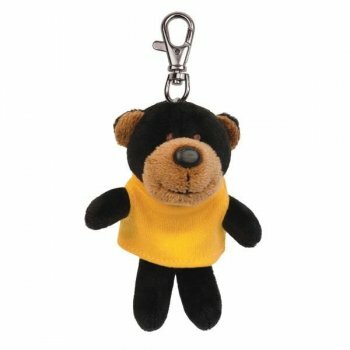 This plush with key tag attracts with its embroidered bear eyes and it can be tucked over backpacks or bags using the lobster claw clasp. You can avail it at excitingly low prices by bulk ordering. Avail free x small T- shirt. CPSIA compliant. Request a quote to know discounts that you can avail for these customized soft black bear key tags.